President Donald Trump chided CNN reporter Jim Acosta during a White House press conference Wednesday afternoon, calling him a “rude, terrible person” for hogging the microphone to share his opinion on multiple topics. Trump called on Acosta, who began questioning the president over his use of the word “invasion” to describe the Central American migrant caravan traveling towards the U.S.
Acosta attempted to ask another question, and a White House aide tried grabbing the microphone out of his hand. “Pardon me, ma’am,” Acosta said. The CNN reporter continued to hold the microphone to ask a question about the Russia investigation while Trump tried to move on to another reporter. Finally, Trump snapped at Acosta. “I will tell you what, CNN should be ashamed of itself having you working for them–you are a rude, terrible person, you shouldn’t be working for CNN,” Trump said. 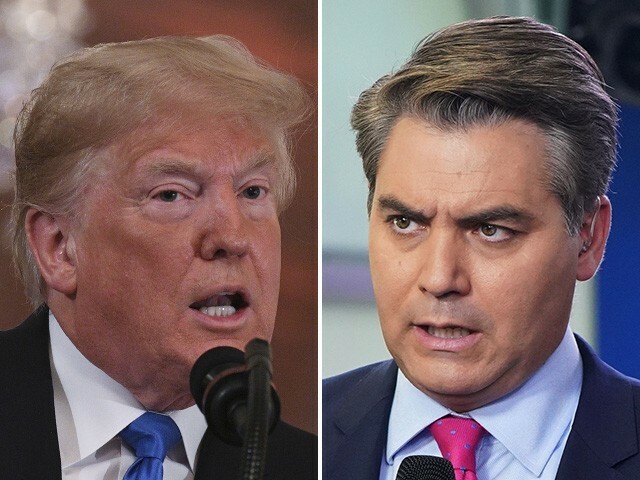 Trump moved on to another reporter, but Acosta stood up again and began asking Trump another question.